﻿ PORTWELL RELEASES INTEL® ATOM® PROCESSOR C3000 SERIES-BASED COM EXPRESS® 3.0 TYPE 7 BASIC MODULE DESIGNED WITH FOUR 10GBE INTERFACES- Portwell, Inc.
Portwell, Inc., (www.portwell.com.tw) a world-leading innovator in the Industrial PC (IPC) market and an Associate member of the Intel® Internet of Things Solutions Alliance, today announces the release of the PCOM-B701, a COM Express® 3.0 Type 7 Basic Module (125mm x 95mm) based on the Intel® Atom® processor C3000 product family (formerly codenamed Denverton). The Portwell PCOM-B701 is designed according to the new COM Express® Type 7 standard which is a new specification with backward compatibility to the existing Type 6 pinout. While the focus of Type 6 is on display-oriented applications with support for audio and video interfaces, the Type 7 pinout definition is designed for applications that do not require graphics support. Specifically, the COM Express® 3.0 specification's Type 7 pinout, when compared to the Type 6 pinout, trades all the graphics interfaces for up to four 10GbE ports, and a total of 32 PCIe lanes. This makes it ideal for applications in micro server and the like that require low power consumption while supporting high computing performance and communication throughput. Portwell has designed this new PCOM-B701 COM Express® Type 7 module to optimize value models and service levels by running network applications securely and reliably on virtualization-optimized platforms. This latest addition extends Portwell's product family of datacenter COM Express® based platforms to enable solutions with even lower power consumption and higher physical density. Back in 2015, Portwell introduced PCOM-B634VG, a Type 6 COM Express® module featuring Intel® Xeon® processor D-1500 series, 10GbE support and integrated VGA, while earlier this year in 2017, adopting also the Intel® Xeon® processor D-1500 product family, Portwell launched its first Type 7 COM Express® module, PCOM-B700G, featuring dual 10GbE-KR ports and up to 28 PCIe lanes. Portwell then extended the success of PCOM-B634VG and PCOM-B700G to design and develop the PCOM-B701, with the Intel® Atom® processor C3000 series, Intel's leadership 64-bit datacenter SoC targeting lower power and high-density design points, to fully meet the COM Express® Type 7 standard by enabling the 10GbE-KR interface to four ports. These four 10GbE-KR ports on PCOM-B701 allow customers to flexibly design their physical interface on a carrier board in several modes, KR for backplane connectivity, copper (RJ45), or fiber (SFP+). Additionally, the NC-SI (Network Controller Sideband Interface) signals provide a way of connecting BMC (baseboard management controller) on the carrier board to achieve remote control and management. Furthermore, there's an optional onboard eMMC 5.0 (Embedded Multi-Media Card 5.0) interface that offloads the main CPU, and provides a cost-optimized storage solution alternative and lower total power consumption. Portwell's clients know they can always count on us to provide them with quality products and longevity support with up to date know-how. Designed with an extensive feature set, the Portwell PCOM-B701 COM Express® Type 7 module is developed on a basic 125mm x 95mm footprint with three DDR4 SO-DIMM slots, up to 48GB dual-channel DDR4 at 1866/2133/2400MHz ECC (selected SoC SKUs), up to 12x PCIe 2.0 x1, 1x PCIe 3.0 x8, 2x SATA 6Gb/s, 1x eMMC 5.0 (optional), and 4x USB 3.0/2.0. Moreover, it is also offered with an option for wide operating temperature support with the range of -40°C to +85°C (selected SoC SKUs). 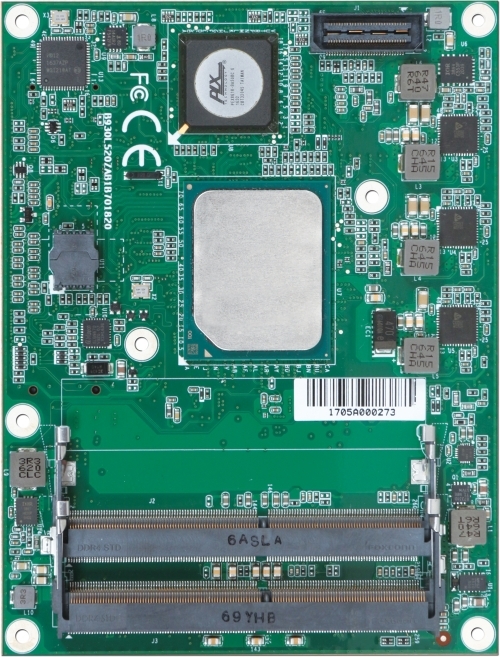 All in all, the Portwell PCOM-B701 module practically implements the Intel® Atom® processor C3000 product family's distinguished features to facilitate broader applications into entry industrial, military/aerospace, energy, robotics and IoT that requires very low power, high density and high I/O integration. As the markets evolve, Portwell's versatile COM Express® modules adapt to the changes by enabling designers to partition commodity host-processors from proprietary carrier boards, thereby minimizing current and future design risks during the initial phase of development. This design of separating the CPU-upgradable module from system specific I/O carrier boards further safeguards development investments and lowers total cost of ownership. With Portwell's ready Type 7 evaluation carrier, PCOM-C700, customers can easily start to evaluate and design. In addition, Portwell can also provide services to clients on the carrier board design and development, review schematics and BIOS customization. At Portwell, we strive to create superior products to help our customers deliver products to market on time and stay one step ahead of the competition. Portwell PCOM-B701 is designed with Intel ® Atom ® C3000 Processor and base on new Type 7 pin definition. It's built in with 10GbE Ethernet KR interface and DDR4 ECC SO-Dimm support which provide high CPU computing, excellent Ethernet performance. Extend PCIE Gen3 ports in PCOM-B701 can support high speed IO card for more applications. In the meantime, it's compatible with Type 6 carrier.